FANCY watching the new episodes of Still Game before anyone else? 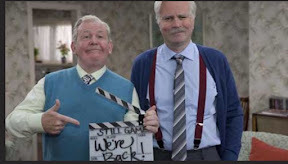 Jack, Victor and the rest of the Craiglang gang return to our screens for for some brand new Still Game frolics later this year. The sitcom by ford Kiernan and Greg Hemphill which sold out its live shows at the SSE Hydro is schedule for BBC One later in the year. Now you can watch the episodes from the brand new series in advance as the show records audience laughter tracks. This is your chance to attend the screening and be part of this exclusive audience. You can register at any time until 5pm on Friday 2 September. You can apply for a maximum of two tickets per screening and, should you be successful in the random draw you will only receive tickets for one screening.